What better way to start October than to wear a newly me-made autumn coat. For the past couple of years, I’ve been wanting to make a coat for myself but have always chickened out, thinking it would be too big a time commitment or would require tailoring tools which I do not own. So when I received an email from the lovely ladies of Deer and Doe asking if I would be interested in reviewing their latest coat pattern “Opium”, I was a little nervous, but also very excited to take this opportunity to finally tackle some outerwear. – I fell in love with that “Sunflower” yellow and I’m surprised how well it fits into my wardrobe. Black, brown, olive, navy, fuschia etc, this yellow coat works with so many of my most worn colors. – I used an “antic white” Boiled Wool for the contrast pieces. My original plan was to only do the origami pockets in a contrasting color but as I was constructing the coat, I realized additional “antic white” accents would balance the look. So the facings and the upper collar became white – I love the result! For the lining, I used an off-white Rayon Bemberg which has a soft silky hand. – I cut a size 36 and made no adjustments to the pattern. Being quite short (5’1″), I thought about shortening the sleeves. But I decided against it to keep my hands covered which are always cold during winter. – Deer and Doe designed this pattern to be an introduction to coat making, which means the instructions walk you through all the steps in great detail. They worked, as I felt confident at every step. I especially appreciated the detailed instructions for the interfacing part. It does take a long time to prep all the pieces but I liked how clearly stated that part was. – One of my coat making concerns was dealing with bulk. Again, the instructions clearly walked me through when/where to reduce excess bulk. The only challenging bit for me was the double-welt area of the pocket; sewing through many layers of fabric on a short seam allowance was tricky to me. However, slightly lengthening the stitch length and using the hand wheel on small areas got it done! 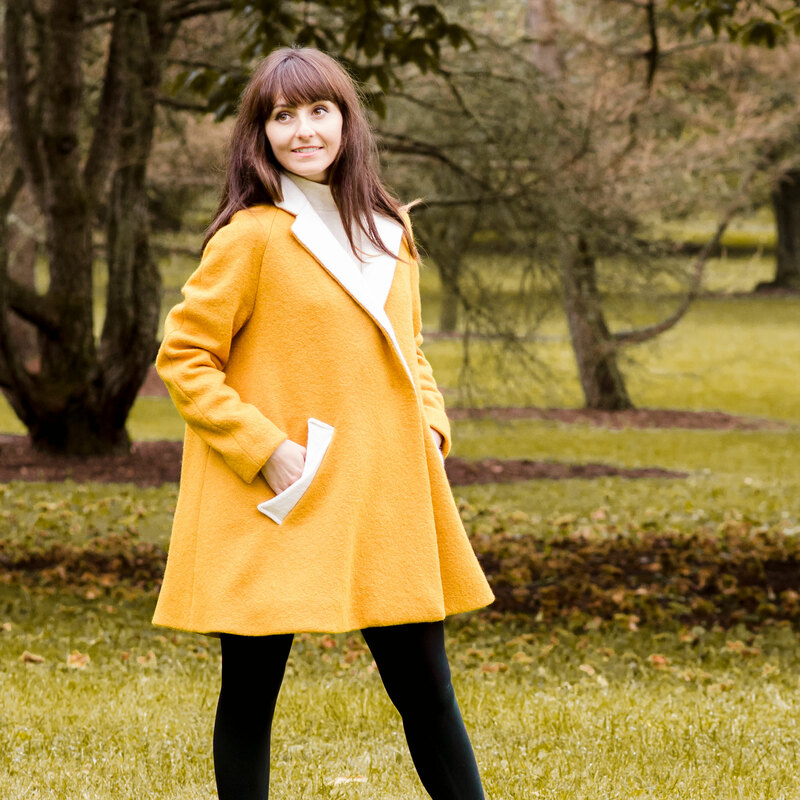 GAH….your coat is GORGEOUS Emmanuelle! I have a similar vintage pattern…but I will consider this one since it gives instructions specific to sewing coats and it has a lining! Oh wow this is gorgeous. What a perfect advert for their new pattern. This silhouette really suits you and the colour is divine! As soon as I saw this pattern I was all starry eyed – seeing yours has only added more stars! Beautiful in this yellow which celebrates autumn in such an uplifting way. I think once I venture into coat making this will be high on my list to begin! Such a beautiful job on the gorgeous coat! I’m moving from Houston to Seattle and cant wait to sew outerwear. Thank you very much Susan! 😊 How exciting! Seattle is such a beautiful city! You’ll definitely need to sew a few gorgeous coats 😉 Good luck with your move! What a fantastic color for fall! Bravo, il est superbe! J’adore ce jaune lumineux et l’idée de faire les poches et l’encolure en blanc pour le contraste est géniale. J’hésite énormément à me lancer mais comme j’ai bestd’un nouveau manteau et que les instructions de DD ont l’air détaillées, je vais peut-être oser.